Help your customers choose healthier foods and drinks, with the official Healthy Choices point-of-sale marketing materials. Eligible food businesses that are implementing the Healthy Choices guidelines can display this impressive signage to assist customers, and demonstrate that they’re aligned with the Victorian Government and Nutrition Australia to promote healthy foods and drinks. Our suite of signage options has been closely developed with Victorian food businesses to ensure there are suitable options for every retail food outlet, vending machine, and catering display. The vibrant designs clearly explain the GREEN, AMBER and RED categories, with attractive images of nutritious foods and drinks that are sure to inspire! Choose from one of our standard packs, or select individual items to suit your signage needs. Displaying the Healthy Choices marketing materials in your retail food outlet, vending machine or catering will show customers that your business has begun implementing the Healthy Choices guidelines, and that this work is aligned with the priorities of the Victorian State Government and Nutrition Australia Vic Division. Demonstrating that your food business is implementing the Healthy Choices guidelines could also increase your chances of winning future tenders or contracts from other organisations that are seeking that commitment. After labelling your foods and drinks as GREEN, AMBER and RED, actively promoting your healthier options is the key to sales success. In fact, a recent trial at The Alfred hospital showed point-of-sale signage increased the sale of GREEN food and drinks items by 26%! The vibrant designs clearly explain the GREEN, AMBER and RED categories, with attractive images of nutritious foods and drinks that will ‘nudge’ staff and guests towards choosing the healthier options. Labelling each food and drink item with the coloured dots takes the guess work out of knowing which options are the healthier choices. Watch the video below, which shows how signage can influence customer decisionswhile mantaining overall sales. GREEN category banner with food images. Explains the traffic light categories on the back. Small, coloured stickers with the words “Green”, “Amber” and “Red”, to label the foods and drinks on your menu, in displays, or in vending machines. Great for fridges, displays, cabinets or smaller spaces like the side of a register or coffee machine. Affix to the side of your vending machine to inspire healthier choices. Features images of foods and rinks commonly sold in vending machines. Featuring the “Choose well. Feel great.” slogan. Perfectly placed at the front of your vending machine. Features images of foods and rinks commonly sold in vending machines. Let people know your platter/display meets the Healthy Choices guidelines (by only containing GREEN and/or AMBER options). 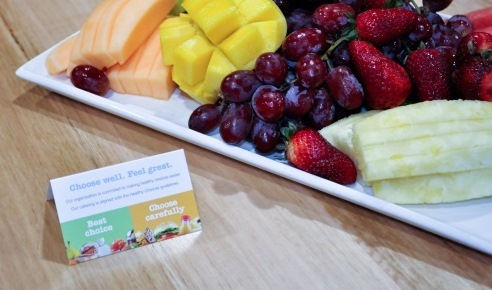 Another great way to let people know that your platter/display meets the Healthy Choices guidelines (by only containing GREEN and/or AMBER options). 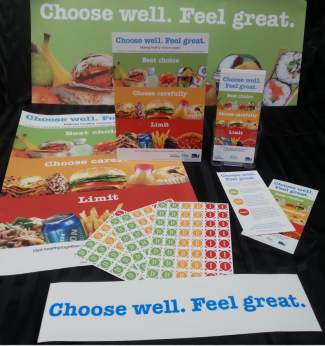 The Healthy Choices signage is available to any Victorian organisation that has achieved key milestones in implementing the Healthy Choices guidelines in retail food outlets, vending machines or catering. Send a scanned copy of your completed checklist (with photo evidence) to heas [at] nutritionaustralia [dot] org. We will be in touch to discuss your application. 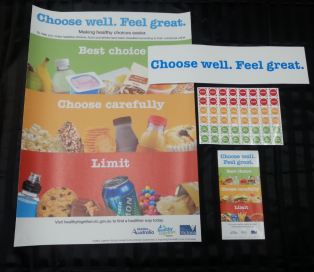 Once we have confirmed that you are eligible to display the Healthy Choices marketing materials we’ll send you an order form to select your signage materials. Send us your completed order form with a method of payment, and we will contact you to confirm your order and shipping dates.